Salinity has been a major abiotic stressor that reduce the productivity. Previous studies reported that endophytic bacteria produce plant stress response hormones, antioxidants, and enzymes such as ACC deaminase. Augmentation of these metabolites and enzymes by endophytes mitigates the stress effects of salinity and improves plant growth and productivity. 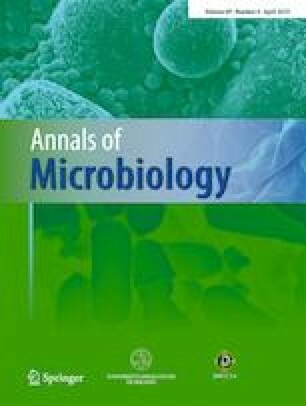 Bacterial endophytes were isolated from Artemisia princeps Pamp, and evaluated for indole-3-acetic acid (IAA), abscisic acid (ABA), siderophore, and 1-aminocyclopropane-1-carboxylate (ACC) deaminase production and the ability to solubilize phosphate in the presence of NaCl (100–400 mM). SAK1 was applied to Glycine max cv. Pungsannamul to investigate salinity stress. Our results revealed that with an increase in NaCl concentration, the amount of ABA production in SAK1 increased, whereas IAA levels decreased. Bacterial ABA and JA degrade the reactive oxygen species and protect plants against stressors. Gas chromatography-mass spectrometry (GC-MS) analysis detected different gibberellins (GAs) and organic acids in SAK1. Interestingly, SAK1 inoculation significantly increased plant growth attributes under normal and salinity stress conditions, whereas a decrease in endogenous jasmonic acid and ABA content in the plants was recorded under salinity stress. IAA and GAs enhance number of root tips and hence improve nutrients uptake in plants. Polyphenolic oxidase and peroxidase were alleviated by elevated SAK1 in G. max plants under stress. ACC deaminase of SAK1 resulted deamination of ACC, up to 330 nmol α-ketobutyrate mg−1 h−1 which could be a major reason of ethylene reduction promoting plant growth. SAK1 relieved salinity stress in plants by producing different phytohormones, antioxidants, and ACC deaminase enzyme. SAK1 could be a new addition in batch of plant stress hormone-regulating endophytic bacteria that mitigates the effects of salt stress and promotes plant growth in G. max. MAK, SA, SMK, and SA conducted the experiments. ALK and IU helped in writing of the manuscript. IJL designed, supervised, and financed the research. All authors have read and agreed to its content and also that the manuscript conforms to the journal’s policies. This research was supported by Basic Science Research Program through the National Research Foundation of Korea (NRF) funded by the Ministry of Education (2016R1A6A1A05011910).